Mark Pratt, with 19 years at GM, left, and his wife, Sherry Pratt, a GM worker for 11 years, outside of the company's plant in Lordstown, Ohio, on Tuesday. Union workers are livid that they agreed to make $118 million a year in annual concessions to save the plant in mid 2017, only to have GM effectively threaten to close it down a year and a half later. The UAW union hall in Lordstown, Ohio, is a hive of confusion, anxiety and anger. Mostly anger. Three weeks after employees at the town’s General Motors Co. compact car plant assembled their last Chevrolet Cruze, employees are filing into the United Auto Workers Local 1112 hall to sign up for unemployment benefits and try to figure out if they should take a transfer to another GM plant, or wait it out in the one factory most have ever worked and see if it survives. Union workers are livid that they agreed to make $118 million a year in annual concessions to save the plant in mid 2017, only to have GM effectively threaten to close it down a year and a half later. Unless the company changes plans, Lordstown will fall victim to the harsh reality that fewer consumers are buying small cars and that General Motors CEO Mary Barra is hyper focused on doing business only where the automaker can earn big returns. GM idled the plant in March, saying demand for the Cruze was too weak to continue. In an email, GM spokesman Dan Flores said the union agreed to many concessions, but that they didn’t address the realities the company faces. The union disagrees the Cruze was a loser and thinks their concessions merit adding another product to the plant, perhaps one being built in Mexico. Of the 38 models GM sold in the U.S., only five did more volume than the roughly 143,000 Cruzes delivered last year. But sedans no longer command much of a premium as car buyers shun them in favor of crossovers, SUVs and trucks. And even at the peak of the Cruze’s popularity, profit margins were thin. The plant’s future will be decided in talks later this year, when GM and the UAW hammer out a new four-year labor deal. President Donald Trump has weighed in, giving GM heat with a demand to reopen the factory or sell it to someone who will. At a rally Thursday in Grand Rapids, Mich., Trump gave the company kudos for investing in an electric-car plant in the state, but the praise didn’t last long. At stake in Lordstown are the livelihoods of more than 1,400 plant workers and thousands more indirect jobs in the surrounding area of northeast Ohio, a key swing state in presidential elections. Married couple Mark and Sherry Pratt are worried about what’s in store for them, as both have been laid off after more than a decade each working at the plant. 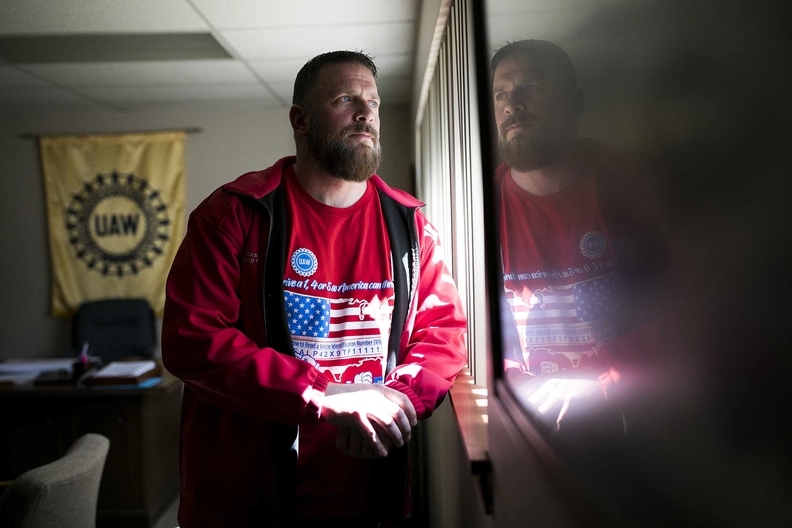 Dan Morgan, shop chairman of the UAW Local 1112, at his office in Warren, Ohio, on Tuesday. It’s a bitter pill for workers who feel they’ve already given up a lot to keep GM happy. Before GM’s announcement that it had no future product planned for Lordstown, Morgan said the UAW agreed to what GM called a “Super Competitive Operating Agreement,” which allowed GM to bring in contractors, temps and other lower-wage staff to work in the plant. It was set up to save even more money than the “Competitive Operating Agreement” that GM used to lower costs at its electric-car factory north of Detroit in Orion Township, Mich.
Morgan started getting nervous in January 2017. GM earned record profit the year before, but sales of the Cruze, the sole vehicle made in the massive Ohio plant, fell 17 percent. GM cut the third shift at the factory along with about 1,200 jobs, leaving more than 3,000 people making almost 190,000 cars a year. As consumers fled to SUVs and crossovers, Cruze sales kept falling and GM eliminated the second shift in June 2018, dismissing another 1,500 workers. At the UAW-GM Center for Human Resources on the Detroit River, Morgan and other union officers met with Scott Sandefur, a GM vice president of labor relations, and Cathy Clegg, GM’s vice president of North American manufacturing, among other executives for a series of meetings from May through July to try to improve profits. GM declined to make Sandefur or Clegg available. 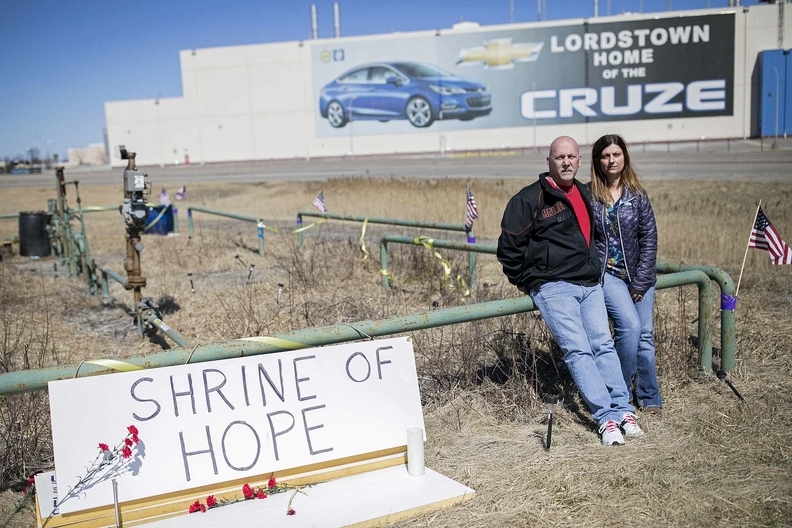 The UAW representatives said GM told them the Cruze wasn’t profitable. Executives also said if the local adopted a more competitive labor agreement to get the car back in the black, it would give them “a way better opportunity to get new products,” Morgan said. To cut costs, the UAW merged Locals 1112 and 1714, which saved the company $3 million a year in administrative costs. Then the union agreed to outsource non-assembly jobs like handling of parts and materials to lower-wage workers employed by a subsidiary called GM Subsystems, according to a document reviewed by Bloomberg. The union then allowed GM to cut the number of skilled tradesmen including electricians, pipe fitters, mechanics and die makers in half to 130 by letting the company contract out for overtime skilled-trade work and by changing job classifications, said Scott Brubaker, who was chairman of Local 1714. The union allowed outside firms to send in contractors to repair supplier parts and assembled vehicles at the plant. It also agreed to drop the number of extra workers employed to cover absentee workers to 60, from 150. Morgan and other union negotiators signed the deal to make all of the concessions GM wanted in late July 2017 and agreed to implement it in January 2018. “All of these things were very unpopular,” Morgan said. GM also agreed to take action to help the Cruze’s bottom line, Morgan said. Management wanted to bring suppliers on site to get parts ready for the assembly line to improve efficiency. Chevrolet’s sales and marketing group was supposed to advertise the car more aggressively and offer deals on vehicle options that might help sales. None of that was done, Morgan said. By October 2018, GM told Morgan that the Cruze was making money again. To his surprise, the company announced a restructuring plan the next month that included Lordstown on the list of plants that may close. The automaker elected to idle Lordstown even earlier than planned after Cruze sales sank 22 percent last year. The UAW has sued, arguing GM can’t close the plant under its existing contract. At an event in Orion Township last week, when Barra announced the $300 million investment in GM’s Chevy Bolt plant, UAW Vice President Terry Dittes, who oversees the union’s GM department, said his team will negotiate hard this summer to keep the plant open. For workers in Lordstown, it’s like purgatory, said David Green, president of the local. Workers don’t know if they should join the roughly 520 people who’ve taken an offer to transfer to a plant out of state, or see if Lordstown survives. “If you wait, there may not be anything to come back to,” Green said.